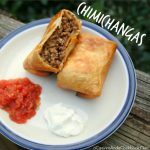 This is a recipe for one of my favorite Mexican dishes, Chimichangas. I could totally eat tacos or burritos once or twice a week with no complaints. However, the fam is not huge fans of tacos. With that being said, I’ve had to come up with some new Mexican dishes. I always know that a dish is a winner when the kids ask for on a regular basis. 1. In large skillet on medium heat brown meat with onions, garlic, oregano, and chili powder. Cook until onions are tender, stirring occasionally. Put the skillet back on the burner and put temp on low. Add in chunks of velveeta. Stir and allow to melt. Make sure the cheese and meat our evenly spread. 2. Put meat mixture in the center of each tortilla. Fold in all sides of tortillas to completely enclose filling. Place on a pan. Refrigerate for 20 minutes. 3. Heat about an inch and half of oil in large saucepan on medium-low heat. Add in the chimichangas. Cook about 2-3 minutes on each side. Service with salsa and sour cream. 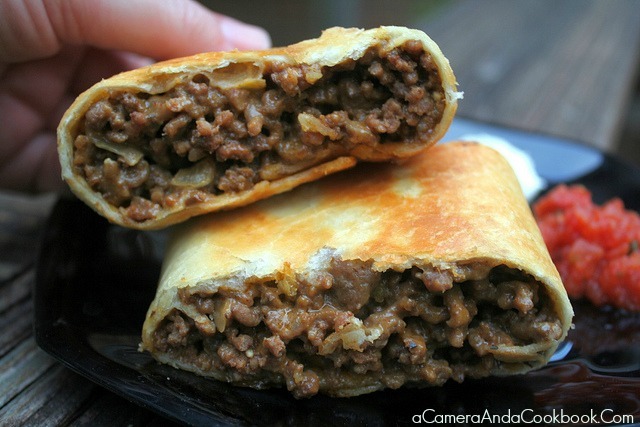 In large skillet on medium heat brown meat with onions, garlic, oregano, and chili powder. Cook until onions are tender, stirring occasionally. Put the skillet back on the burner and put temp on low. Add in chunks of velveeta. Stir and allow to melt. Make sure the cheese and meat our evenly spread. Put meat mixture in the center of each tortilla. 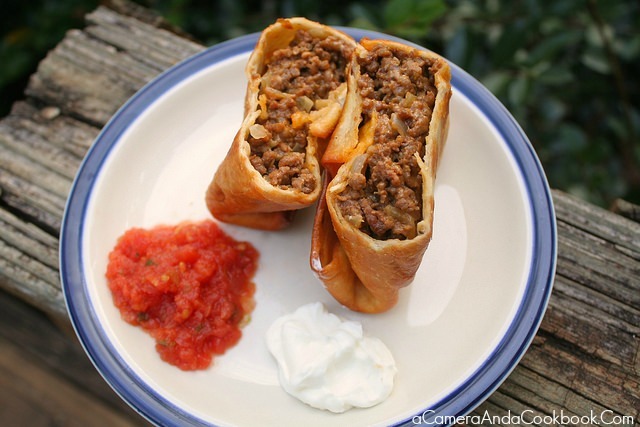 Fold in all sides of tortillas to completely enclose filling. Place on a pan. Refrigerate for 20 minutes. Heat about an inch and half of oil in large saucepan on medium-low heat. Add in the chimichangas. Cook about 2-3 minutes on each side.